I had plans of hiking and exploring in the San Rafael Swell this weekend. Things started off well. I left after work on Friday, drove to Green River and had a burger at Ray’s Tavern before finding a campsite and getting to bed. The weather forecast predicted that the temperature would drop down into the teens overnight, but in reality it never dipped below 30 degrees and I slept comfortably in the back of my Jeep. I woke up about 40 minutes before sunrise on Saturday morning and hoped to get an early start hiking, but about two miles from camp it felt like my Jeep had got caught on a large rock and was dragging it. 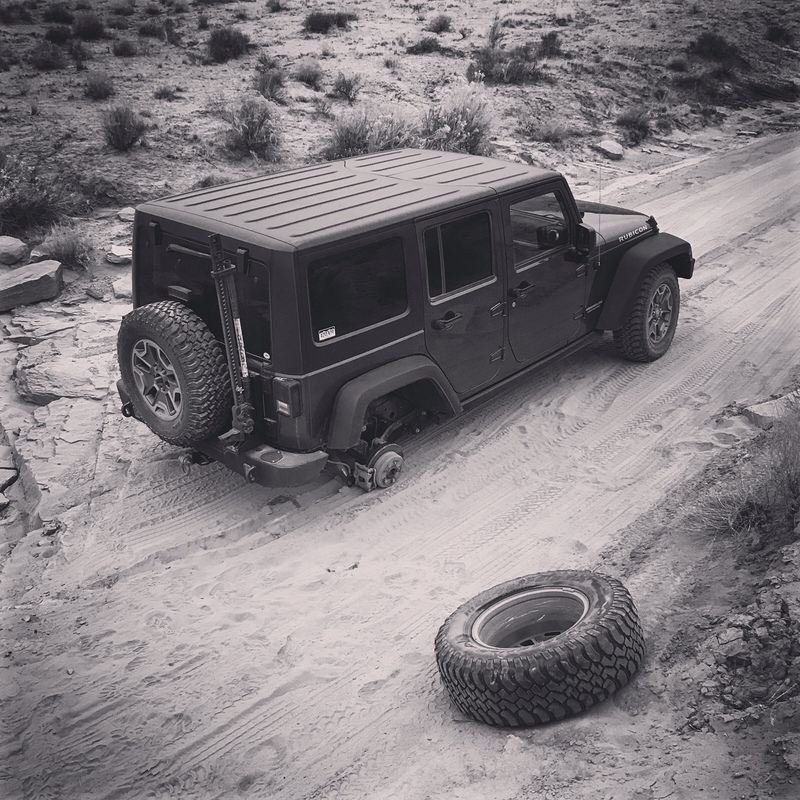 When I got out to see what was going on, I found that one of my rear tires had come completely off the Jeep. After checking out the damage I found that all five lug studs had broken off. At first I tried to put the tire back on and see if I could thread a few of the broken studs with lug nuts borrowed from other wheels, but I was only able to get two started and they were barely held on by a couple of threads. After driving a few feet one of the lug nuts popped back off and the wheel was sitting at an angle ready to come completely off again. I grabbed my backpack and hiked a few miles back up the road to where I had cell phone signal again to call for a tow. 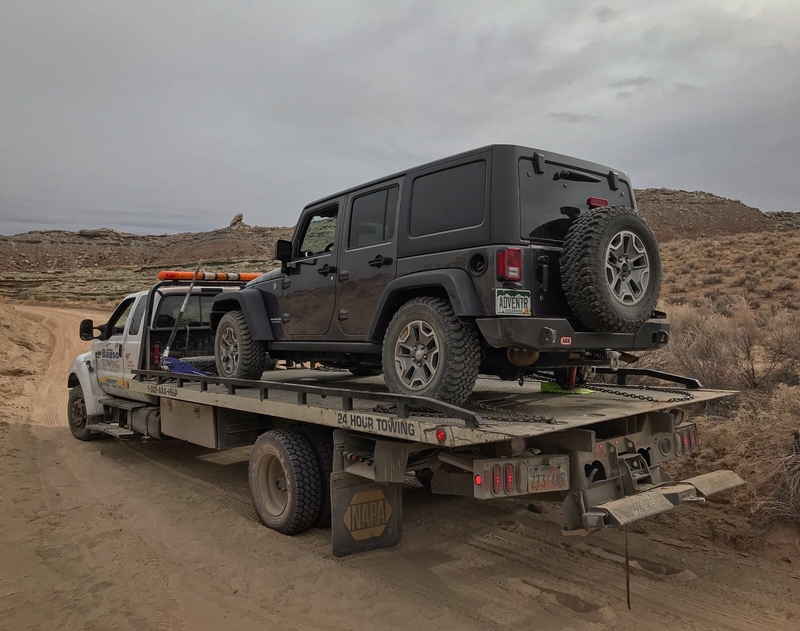 About an hour later a tow truck from Helper showed up and was able to load up my Jeep. I was unable to find anywhere in Green River that was open or had the parts I needed, so I asked Jake, the driver, if he recommended anywhere in Price. He called a friend at a shop who was able to find the parts and had time to get my Jeep fixed today, so that’s where we headed. A few hours later my Jeep was fixed up again and back on the road. I suppose I could’ve found a campsite for another night and salvaged some of the trip on Sunday, but I decided to just cut my losses and head back home. I really wasn’t in the mood to go hiking at this point.